My good friend's son's pet parakeet just died. I've lost three birds myself, they are quite fragile creatures, so I know what he is going through. So I made him this sympathy card. I know its a parrot image, and not a parakeet image, but I'm sure he'll appreciate it nevertheless. I probably should have looked up how parrots are colored, I colored him like a lovebird, cause that what I know, I don't know how parrots are colored, but I was too lazy/busy/whatever. LOL! Anyway, I can't tell you who designed this bird image because I picked it up at a local scrap booking store where they literally had a child's swimming pool filled with unmounted stamps. It was so overwhelming because you had to dig through this pool of stamps and then try and figure out what the image even was when its backwards on the stamp and there's no picture of it. It was so frustrating. The images were three for a dollar, but I don't know if the experience was even worth the cost savings. LOL! Hello and welcome to another Digital Tuesday Challenge! Today's challenge is "Heart to Heart": show someone in your life how special they are to you by including a heart somewhere on your project. This week's sponsor is our very own Digital Stamp Oasis. They are offering three digital images to one lucky randomly chosen winner. For my card today I used the Digital Stamp Oasis 'Mail for You'. Isn't this just the most adorable image? I love the smile on her face and the sparkle in her eye as she notices the cards of love in her mail box. And would you believe I have 6 hearts on my card? It doesn't look like it does it? But I do! There are 4 heart brads, and two card stock hearts. The image was colored with Copic Markers, the card stock colors are Sage Shadow, So Saffron, Ruby Red, and Close to Cocoa (all from Stampin Up!) and the designer paper is Cosmo Cricket. If you'd like to play along with us this week and get a chance at winning some cute images from Digital Stamp Oasis, simply click on the Digital Tuesday Challenge Blinkie in my side bar and it will take you directly to the challenge site. Sip and Relax. That sounds good to me. Maybe I need to send this card to myself. My work schedule has been grueling. If you work in retail, between now and Christmas, you are BUSY! I've been working 6 days a week. Sometimes I think I should not even bother to come home and just sleep in my car in the parking lot. LOL! But I sure am enjoying the money though! Right now it just goes right in the bank because I have no time to spend it, but when I do have time to spend it, it will be fun! LOL! I made this card weeks ago for the CC233 Color Challenge on Splitcoaststampers, but since I haven't had time to create anything 'new', I'm posting this one now. The colors were Real Red, Chocolate Chip, and Kraft. The image is from Papertrey Ink 'Tea for Two'. I just love this little tea pot, and since I am a tea drinker, and I collect tea pots, I thought it was the perfect set for me to own. I mounted both the tea pot and the sentiment up on dimensionals. All the various shapes on the card were cut using Spellbinder's Nestabilities. Well I know I'm too old for this, but I like 'Cute'. I have many different styles I love and do: vintage, romantic, etc., but 'Cute' is on my favorites. There is something about a 'Cute' image or card that always brings a smile to my face and brightens my day. Today I have two 'Cute' cards to show. The first one is almost a direct case of this MASTERPIECE of this week's amazing SCS Featured Stamper 'Tankgrl'. My jaw dropped the moment I saw this card and I just had to make it. It was so much fun to put this card together. I kept it almost identical to the original, and I just changed the sentiment, papers, and added some water lilies. All the images are retired Stampin Up! 'Unfrogettable', except for the cat tails. I had to hand-cut those from card stock. The designer paper is also SU! and the card stock colors are Tempting Turquoise, Close to Cocoa, and Chocolate Chip. The frog, cloud, and 'friend' chipboard sentiment are all mounted up on dimensionals. Today I have three Crafty Secrets Cards to share with you. The first card I made for the Paper Craft Planet challenge to use Fall Colors on your card. I also used this month's sketch from Sheetload of Cards, but I flipped the sketch. Sheetload also wanted us to make a fall card this month. Isn't this image crazy? Its from 'Halloween Fun', they are little vintage monsters made from veggies. I like Halloween cards that are fun, but not scary. And this certainly fits that description. The designer papers are all from Debbie Mum 'Harvest and Holiday' and my sentiment is on the button. It says 'Spooky'. My second card was made for this week's Crafty Secrets on Splitcoaststampers called 'Falling for Fall' where we were instructed to make a fall card. I also used this week's Colors for the Color Challenge on SCS: Rich Razzleberry, Crushed Curry, and Basic Black. I thought those colors were very Halloweeny, so I pulled out my 'Halloween Fun' set once again. The image is colored with Copic Markers. My last card was made for last week's Crafty Secrets Challenge: 'Baking Time'. Simply make a card with a baking theme. I've wanted this set for a long time, so when I saw the challenge, I ran to my local scrap booking store and bought it. The images are from "Sweet Stuff'. I used DCWV 'Nana's Kitchen' designer paper. Good morning everyone! Welcome to another Digital Tuesday Challenge. Today's challenge is 'Falling Leaves': make a project using colored leaves. The leaves can be part of the image, a die cut, brads, etc. Be sure to use at least one digital image on your project too! This week we have a new sponsor called McMahon5Designs. She is giving away the four digital images seen in the picture below to one lucky randomly chosen winner. For my card, I used McMahon5Designs Cornucopia image. I colored the image with Copic Markers and highlighted some of the tops of the veggies with a white gel pen. My leaves are stamped images from Hero Arts that I colored and cut out. The designer paper is DCWV 'The Fall Mat Stack'. A natural hemp ric rac and button and twine were added for embellishment. If you'd like to play along with us this week and have a chance of winning those gorgeous images, simply click on the Digital Tuesday Challenge Blinkie in my side bar and it will take you directly to the Challenge Site with further instructions. Thank you to all my wonderful Internet friends who always have such a sympathetic ear! I had another rough weekend at work, (but this time I won't get into it and bore you with all the details LOL! ), so it was so nice to read your wonderful and encouraging comments this morning. My good news is is that I won a couple of challenges that I played in. The first one happened a couple of weeks ago, but I'm first getting around to sharing it now. LOL! My scarecrow card that I made for a Paper Craft Planet Sketch Challenge was selected as their feature 'Shooting Star' and was featured in their gallery and newsletter. And my Christmas Card that I made using the August Sheetload Sketch won for best card. I think I won a stamp set or two for that one! Yippee! Thanks for letting me share some good news for a change. LOL! The card I'm showing you today was made for last week's sketch challenge on Splitcoaststampers. I used the MFT image 'The Poppies' and colored it with Copic Markers. The paper is Cosmo Cricket 'Early Bird'. Isn't it fun? I cut some stars with my Cuttlebug and added a clip and ribbon for embellishment. Good Morning! I was so tired after a nine hour day at work yesterday, then two hours grocery shopping, then the one hour drive home, that as soon as those groceries were unpacked I went straight to bed and slept for 10 hours and now I feel great. I had another horrible day at work yesterday and wondered for the 100th time why I am even working there. Then there are days when I love it so much, I can't ever imagine not working there. Yesterday was just stressful because one person quit and another person didn't show up, so as usual, we were extremely busy and understaffed. I worked 9 hours without any breaks, only a lunch break, working constantly taking care of people, so you can only imagine how tired I was becoming being on my feet all day. Anyhow, to add to my misery, I was discussing with another employee about how stressed out I was because of how overworked and understaffed we were WHILE I was waiting on a customer (trust me she was not being neglected. She never even had to wait. She wasn't even trying to talk to me, and she was digging through her purse the whole time) and as she walked out the door she sarcastically screamed at us 'Great customer service ladies!'. I was like, you have got to be kidding. Did you not even hear a word of our conversation? Can you not have one ounce of sympathy and you have to make our terrible day even worse? Couldn't you have brought some 'sunshine' to our day and offered some encouraging remark instead? Now, I'm sure she'll just send some nasty email to corporate (they all do) and we'll be in for it. So I already told the manager the whole story and apologized, and said I never should have been discussing personal matters in front of a customer and it won't happen again, I was just tired and stressed and my judgement and performance level was off. She understood and wasn't upset. She was probably just happy that I actually show up for work, and that I stay late when I'm needed. LOL! This first one was made for last week's sketch challenge on Splitcoaststampers. The main image is retired Stampin Up! 'Season of Thanks' and the sentiment is from Hero Arts 'Happy Thanksgiving'. The designer paper is DCWV 'The Fall Mat Stack', and card stock colors are Bravo Burgandy, Old Olive, Really Rust, and white. I put Stickles on some of the flowers and the image is colored with Prismacolored Pencils. The second card was made for last week's color challenge on Splitcoaststampers. I thought the colors were very 'Halloweeny' looking, so I made a Halloween card. The card stock colors are white, Old Olive, Basic Black, and Elegant Eggplant. The images are from Hero Arts 'Happy Halloween'. The Ghost is popped up on dimensionals, and the bats are stamped on the paper. My fourth card was made for last week's sketch challenge on Paper Craft Planet. The pumpkins are Cuttlebug Cut and Emboss die cuts. The brads I bought at JoAnn's....aren't they pretty? They sparkle too! They are in the dollar bins if you have a JoAnn's near you. The twine is Martha Stewart, and the Sentiment is from Inkadinkado. Designer paper is DCWV 'The Fall Mat Stack'. And my last card uses an old image I purchased at a rummage sale, so I don't know the name of it. I popped up two of the pumpkins, put Stickles on the sunflowers, and added some Hero Arts fall leaves. The image is colored with pencils. My daughter asked me to make a sympathy card for her accompanist. Her husband died of a heart attack while driving his car. They are actually not sure if he died of a heart attack, or a car crash, because he crossed four lanes of traffic and crashed his car while he was having the attack. He was only 42 years old and a marathon runner in perfect shape. I can't even imagine what this poor woman is going through. They have children in middle school too. If you have a few moments today, please say a prayer for Cindy. So I used the Color Challenge on Splitcoaststampers yesterday to create this card. The colors this week are Whisper White, Pretty in Pink, and Soft Suede. The images are digital images from Fred, she Said called 'A Lovely Blossom and Butterfly'. I cut out and mounted up several of the flower images. I put Stickles and adhesive pearls on the butterfly and in the center of each flower. The cross is a charm I purchased at JoAnn's. I know it really doesn't matter now, but I really don't think running marathons is good for the body. I have heard so many times of this sort of thing happening to a marathon runner. Even the author of the book 'Running' died of a heart attack while running. If the heart is an engine, just like you can wear a car out by running it too much till it gets too many miles on it and dies, can't the same thing happen to a heart in a human body? I just think it stresses the heart too much. I mean, look at what those people look like after running a marathon! Congratulations Patti. I've already emailed you asking you to send me your address so I can get your goodies out to you a.s.a.p. Now, onto today's Digital Tuesday Challenge: make a Clean and Simple Fall Card. This is the second time we were asked to make a clean and simple card on our challenge blog, and the it was the second time many of us designers struggled. Most of us are not CAS card makers, that's why. But we all tried. Here is my attempt. LOL! The sponsor this week is KLM Designs. She is giving this week's randomly chosen winner these three digital images. The image I used for my design is also from KLM Designs and is called 'Back to School Brett'. Isn't he a cutie? buttons I bought on clearance at Joanne's. Aren't they adorable? Below is a close up so you can see the coloring. Happy Anniversary to ME! Happy Anniversary to ME! Happy Anniversary dear Amy,.....well you get the idea! On September 15, 2008 I began my blogging adventure. And my, what an adventure it has been. I've made lots of new and great Internet friends who have shared my sorrows and joys, and have supported me in my paper crafting adventures, I've become a designer for a challenge blog, and I've also learned a lot from YOU by following YOUR Blogs! I have no idea of how many actual 'hits' I have had on my blog this past year, because I didn't even get a counter till about 6 months into it, and then I had to stop and restart it several times because it kept malfunctioning, so, unfortunately I can't tell you how many total hits I've had this past year. LOL! Hello and welcome to another Digital Tuesday Challenge. This week's challenge is 'All About the Kids!'. Simply make a card or project using a digital image of a teen, child, or baby. This week's sponsor is 'Cut it Out Paper Crafts' and she is giving away three digital images to one lucky randomly chosen winner! For my card today, I used the image 'Chad playing guitar' by Cut it Out Paper Crafts. I colored him with Copic Markers. I used 'Urban Youth' designer paper for my background and cut out a jagged edge using decorative scissors. The sentiment is by Inkadinkado, and the stars are brads. Here is a close up so you can see the coloring. Isn't he a 'cool looking dude'? Any pre-teen or teen boy would love to receive this card! If you'd like to play along with us this week simply click on the Digital Tuesday Challenge blinkie in my sidebar and it will take you to the challenge blog where you will receive further instructions. Happy Labor Day everyone! I hope you all had a wonderful, relaxing day. I didn't, I had to work all day, and the store was very busy, and we were very understaffed as usual, so it was very stressful. I just kept chanting to myself all day 'Time and a half, Time and a half', to help me make it through the day. LOL! My card for today was made for last week's color challenge on Splitcoaststampers. We finally got to use some of the new Stampin Up! In Colors: Bermuda Bay, Crushed Curry, and Melon Mango. My images are digital images from Fred, She Said called ' A Lovely Blossom and Butterfly'. I cut out the flower three times and mounted each layer on dimensionals. The butterfly was printed twice and cut out once and is also mounted up. I also put Stickles on the wings. The sentiment is from retired Stampin Up! 'Love Blooms'. I know I'm a week late with this post since my good friend Darlene was chosen as the Featured Stamper on Splitcoaststampers LAST week Sunday, but, better late than never. I chose this card of Darlene's because I bought the same stamp set, but never used it, so I thought: 'Time to put it to good use'. The image is from the Stampin Up! set 'Thoughts and Prayers'. Its stamped in Certainly Celery and Pixie Pink ink. I put adhesive crystals in the centers of the flowers, and the main image panel is mounted up on dimensionals. The designer paper is K & Company 'Hopscotch'. 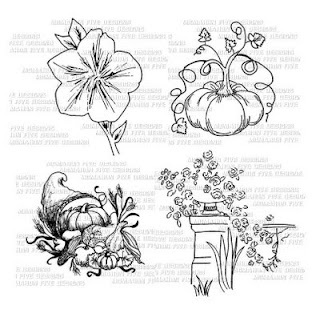 Well the fall decorating at my house has been completed, and I just started cutting down the perennials in my humongous garden...that will take a couple of months of hard labor before its complete, so I thought I might as well start working on my fall cards too. The first one uses last week's sketch on Paper Craft Planet. I used the retired Stampin Up! set 'Happy Fall Ya'll'. The images are colored with Copic Markers. I cut out and popped up the pumpkin on dimensionals. The designer paper is DCWV 'Fall Matstack', other card stock colors are Old Olive, More Mustard, and Chocolate Chip. I used chalk to color in the sentiment. My second card isn't really a fall card, its more of a fall birthday card, and I used this week's sketch on Splitcoaststampers. I used the same designer paper as in my first card, and the card stock colors are Old Olive, Close to Cocoa, and Chocolate Chip. The image is a digital image from Digital Stamp Oasis. If you'd like to purchase this image, simply click on the Digital Stamp Oasis Blinkie in my side bar and it will take you to the Etsy store. The sentiment on this card is from Clear Dollar Stamps 'Just Nutty', and the acorns are a retired SU! image that I cut out. The oak leaves are a Martha Stewart punch. I also colored this image with Copics and mounted the main image panel up on dimensionals. Good morning! Today I have a couple of Crafty Secrets cards to share with you. The first one I made for the Crafty Secrets Challenge on Splitcoaststampers where we told to 'Play with Plaid'. I chose this image from 'Sweet Kids' because the little boy is wearing plaid shorts. I created my own designer paper by using the retired Stampin Up! stamp 'Homespun Plaid' and Brocade Blue ink. I just love this image, because it reminds me of when I was a little girl and I actually had the time to just lay in the grass and daydream. They were certainly 'golden hours' that I will never have again. My second card is also reminiscent of 'golden hours': young love. I love the early stages of romance when your first falling in love and you have the time to just sit together and do nothing but stare at a beautiful moon or sunset. But eventually life just gets in the way and you barely have time to schedule a 'date night'. This is one of my favorite all time images from Crafty Secrets. Its from the set 'Cherish'. I made it for the Crafty Secrets challenge on Paper Craft Planet where we were to make a card with a different fold. I got this fold idea from the May 16, 2008 blog of 'Thinking Inking'. The scalloped circle part of the card lifts up revealing the sentiment inside. I stamped the image twice and cut out the couple and mounted them up on dimensionals so that the moon would look farther away. The image is colored with Prismacolored Pencils and Gamosol. The sentiment on the front of the card is embossed with white embossing powder. The pearl brads are from Martha Stewart Weddings ensemble. The paper is K & Company Here is a view of the inside of the card. Its Tuesday! And time for another Digital Tuesday Challenge! Today's challenge is 'Lace and Pearls'. Simply make a card or project using Digital Images and put lace and pearls on it. If you don't have real lace, you can also use punches that look like lace. This week's sponsor is the wonderful Fred, She Said. I just love Tracey's images, and have purchased many of them. She is giving away a $10.00 gift certificate to her store to one lucky randomly chosen winner who plays along in the Digital Tuesday Challenge.